Dr. Ifeanyi Arthur Okowa, of the Peoples Democratic Party (PDP) has finally taken his place as the Senator representing Delta North Senatorial zone in the 7th Session of the Senate and National Assembly. 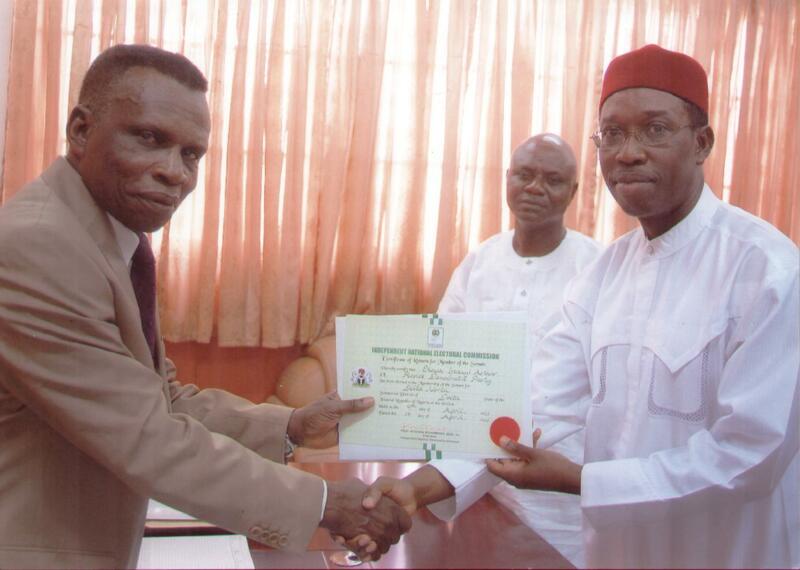 The process of confirming him as Senator for the Delta North district after the April 2011 general elections was formalized, when the INEC National Commissioner in charge of Edo, Delta, Bayelsa and Rivers States, Dr. Ishamael Igbani, presented Dr. Okowa with the Certificate in Asaba, after the Court Injunction by an Abuja High Court, which had prevented INEC from issuing him the Certificate was vacated and the INEC in Delta state duly complied. Delta watchers will recall that Okowa was not presented with his certificate of return by INEC, during the official presentation to victorious candidates held at Grand Hotel, Asaba, for the reason that an Abuja Federal High Court had issued an injunction to stop INEC from doing so. Witnesses at that presentation ceremony will recall that Dr. Okowa had lined up with other elected members to collect his INEC Certificate, but was denied by the INEC National Commissioner, who said that a Federal High Court injunction restrained them from doing that in response to a prayer by the Democratic Peoples Party (DPP) Candidate, Prince Ned Nwoko who claimed that the elections had been flawed. A remarkably calm Okowa later told newsmen after the ceremony that although the decision not to present him with the certificate had come as a kind of shock, he will however instruct his legal team to look into the matter, which from the prayers contained in the injunction, was constitutionally a post-election issue meant for the election tribunal and not the civil Court. Dr. Okowa then missed the induction retreat for newly elected NASS members, while waiting for the matter to be resolved but he has now laughed last when he proudly took his place in the Senate on June 6th 2011 as the Senator representing Delta North Senatorial zone, in the 7th Session of the Senate. He celebrated his endorsement as a Senator of the Federal Republic of Nigeria on Sunday, June12, with a well attended thanks-giving service in his Ika hometown to affirm to all and sundry that he is indeed the Senator representing Delta North Senatorial District in 7th Session of the National Assembly. However, the contentions of Prince Ned Nwoko and the DPP over of the Delta North Senatorial zone election is now before the Delta State elections petitions tribunal and it is expected that a resolution will be made at that level sooner than later. But there seems to be even more to the Okowa Certificate saga than meets the eye and the genesis of what transpired at the Certificate giving ceremony may have even dated back to the very early days when the Peter Nwaoboshi led PDP Exco came into office, as presented in this investigative and well researched analysis. It had all started as a rumour, when news went round that some key figures in the leadership of the Delta state PDP had already endorsed Dr. (Mrs.) Mariam Ali (Enyi Kpakpando) as the preferred candidate for the Delta North senatorial seat. It will be recalled that Mrs Alli had also been seen as an imposed candidate by the PDP on Delta North through the influence of her husband, former PDP National Chairman, Ahmadu Ali in 2007. She contested and won the PDP primaries in Delta in 2007, against incumbent Senator Patrick Osakwe, who with the support of them Governor Chief James Ibori, crossed over to the Accord Party, which Ibori had allegedly founded and funded for any of his supporters who was denied PDP candidacy. Osakwe won from that party – just like some other members of the present Delta State House of Assembly, and later returned to PDP. Those who claimed that Mrs Ali had been endorsed by the PDP in Delta hinged their claim on the argument that Party Chairman Peter Nwaboshi, who is generally regarded as having been installed by Mrs. Ali, was under pressure to return his benefactor as the senatorial candidate of the party in the zone, as part of an agreement reached at that time. Delta political commentators will remember that in the days following the 2007 elections, the battle for the leadership the Peoples Democratic Party (PDP) in Delta state had attained frightening levels in a do or die endgame that pitched the Ibori political machinery led at that time by the out-going chairman, Elder Emmanuel Ogidi against what remained of the Godswill Obielum political structure which was inherited by Mariam Ali. In Mrs. Ali’s camp were major political stalwarts like Peter Nwaoboshi, Cairo Ojougboh and Ndudi Elumelu amongst others and while they had all seemingly toed the party line and supported the emergence of Governor Emmanuel Uduaghan, the leadership of the party was another matter entirely, not only because of the infamous PDP slogan, ‘Party is Supreme’, but most importantly in terms of positioning adequately for 2011. Having lost the Senatorial race as a result of political miscalculation, a wiser Mrs Ali went to Abuja and through the influence of her husband, who was still national party chairman and who had been thoroughly humiliated by her defeat, was allegedly given the mandate to supervise and also compile the delegates list for the State party congress, which she naturally filled with most of her loyalists. Her calculation was that since she had lost out in the Senate race, this was her golden opportunity to ensure that she secured the post of Party Chairman to her camp. Thus, the atmosphere was already charged with ultra-violet tension when she arrived the party secretariat in Asaba, and things boiled over when she was literally held captive in one of the offices, by the status quo which demanded that she produced the list before conducting the congress. She refused bluntly and things would have really turned ugly and fatal if not for the timely arrival of Hon. Cairo Ojougboh, with a busload of ‘boys’ and Elder Godsday Orubebe, then Minister of State in the Ministry of Niger Delta, at the scene, both of them, ostensibly called in by Mrs. Ali, before her phone was allegedly seized by the PDP leadership. It took the mediation of Governor Uduaghan to finally settle the matter in what seemed at that time like an astute piece of brinkmanship. Mrs. Ali got her way and planted Peter Nwaoboshi (Oracle) as Party Chairman with Chief Ighoyota Amori (Odidimadi), representing the Uduaghan-Ibori camp as Vice Chairman. She also got some key positions in the Party Exco and everything appeared to be working smoothly. The unwritten agreement at that time was that Mrs. Ali would get the Delta North Senate seat unopposed, but it all backfired so dramatically in the race for the 2011, Delta North Senatorial seat. In the midst of all these, Dr. Ifeanyi Okowa had quietly but clinically positioned himself as the Secretary to the State Government (SSG), after serving as Director General of the Uduaghan campaign. Recall that Okowa had actually placed second in the Ogwashi-uku governorship primaries, and some knowledgeable insiders had even claimed that he won, so when he took up the offer to manage Dr. Uduaghan’s campaign, many Delta Northerners felt dismayed to say the least and even the position of SSG did not appear to assuage them. But Okowa soldiered on as SSG and had even been appointed the DG for the Uduaghan 2011 campaign organization in a move which many saw at that time as a ploy by Governor Uduaghan to force his hand to declare for an elective position, following the alleged frosty relationship between the two men and the insinuations that Okowa was actually nursing governorship ambitions of his own, for 2011. Thus, when Dr. Okowa finally resigned as both SSG and Uduaghan Campaign Co-ordinator and subsequently declared his intention to run for the Delta North Senatorial Zone seat, the temperature of the political environment rose up several levels. The fact that Mrs. Ali had never jettisoned her interest in the Senate and also that the likes of Hon. Cairo Ojougboh, who had moved to Abuja to become a Presidential Liason; Prince Ned Nwoko, the pioneer House of Reps member for Aniocha/Oshimili Federal constituency; Hon. Pascal Adigwe, who took over from Nwoko in the House of Reps and the imminent rumour that incumbent Senator Patrick Osakwe was keen to return to the upper chamber, and indeed the fact that they were all contesting on the platform of the PDP, set the scene nicely for a titanic battle in the primaries. Governor Emmanuel Uduaghan actually played a major role in the entire saga of the Okowa INEC certificate debacle. Recall that he was the mediator who brokered the seeming convenient resolution of the Delta State PDP Chairmanship tussle, but what many Delta watchers did not realise at that time was that Uduaghan, faced with the perrenial headache of Chief E.K Clark, needed to put the Delta PDP house in order and quickly too, because Chief Clark and his team, having already complained that Uduaghan was imposed as Governor on Deltans by his cousin, James Ibori, had now gone ahead to form his own parallel faction of the PDP and had even elected a Chairman in the person of a certain retired military man called Onyekweli. This was in addition to the Delta State Leaders and Elders Council which he was heading and which had a number of influential Delta Statesmen in its fold. Thus, by reconciling the strange bed fellows together in the recognized Delta PDP faction, he not only partially staved off the angry howlings of the Chief Clark faction, but also bought useful time for himself and his administration by stemming the diversion which the internal party crisis had provoked. He also even managed to win the support of Chairman Nwaoboshi through what many party insiders claim was an overdose of generosity in both juicy contracts and party funding, especially in the many trips to the Wadata plaza national secretariat, Abuja and the periodic litigation hearings instituted by the E.K Clark faction. In all these too, Dr. Okowa was seen as a very active and compliant party man and emissary both as SSG and as a key player in the political space and in the process was cleverly building his own political structure with clinical precision. In fact his political stature grew so fast that some key members of the Uduaghan political team not only raised eyebrows but even questioned his loyalty openly and tried to pressure up his removal. Uduaghan, too was said to be somewhat frightened and although he kept Okowa as SSG after some public showing of support and private assurances of loyalty, he was to play a fast one later by appointing Okowa as DG of his Campaign. But by then, Okowa had already made up his mind to run for Senate. Again, in the run-up to the 2011 elections, Governor Uduaghan had, in October 2010, commenced a series of meetings with all the PDP contestants and aspirants who had bought nomination forms and had been duly cleared by the party for elections. The objective of the meeting was to address the rising political tension in the state and to warn politicians to stop heating up the polity or face the full weight of the law. The first set he met with were the aspirants from Delta North with all the top names for the Delta North senatorial seat in attendance and in addition to reading the riot act to them, Governor Uduaghan told them categorically that he was not supporting any candidate for any position in the forthcoming elections. This assertion was necessary because wide spread speculations was making the rounds that the PDP had already written the script and penciled the names of their choice candidates in all elective positions across the state, even before the primaries. In fact many insiders had concluded that this scenario had been perfected and was a done deal until two things happened. First, Delta PDP congresses across the state were canceled and the party ordered to conduct fresh congresses, following an avalanche of complaints by members who felt they had been rigged out. Second, the administration of Governor Uduaghan was shockingly and dramatically terminated by an Appeal Court sitting in Benin, Edo State and a re-run election ordered by the same court within ninety days. This shocker came just a few days after he had submitted his nomination form to contest as Governor for a second term and was in the groove to commence a triumphant campaign rally across the state. The mantle of leadership then fell on Rt. Hon Sam Obi, the Speaker of the Delta House of Assembly who, unquestionably, was regarded as Okowa’s main man in Ikaland. In his short reign, Rt. Hon Obi left no one in doubt as to his loyalty to Okowa and used his new authority not only to complete some key projects in Ikaland but also allegedly enhance the financial war chest of his mentor, Okowa, and even impact substantially on PDP affairs in the state by openly admonishing and privately overiding some of the decisions of the party to the embarrassment and chagrin of Chairman Nwaboshi. 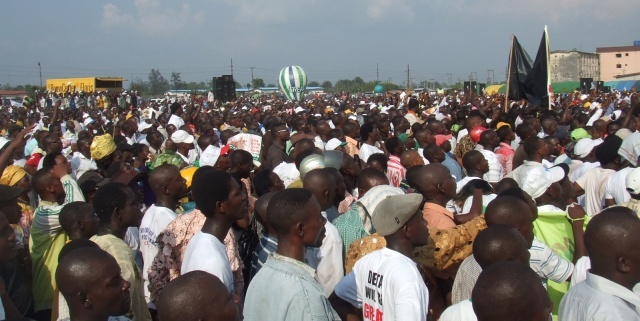 When the re-run election was announced for January 6, 2011, Okowa and Obi virtually took over the rallies and vigourously campaigned for Governor Uduaghan’s return. They practically and visibly relegated the influence of the Party Chairman to the margins especially in Delta North and Okowa’s political profile attained its zenith, both within the PDP and in the public eye at this point. Governor Uduaghan won the re-run election, but was shocked to discover that he was not as well loved as his advisers had made him believe and had lost a lot of loyalty even from within his own cabinet, as most of those who worked for him had actually believed that Great Ogboru, who had simply overwhelmed the political space and was enjoying an unprecedented outpouring of popular support and acclaim, would triumph in the elections. Thus, with his victory secured and his powers restored, Uduaghan suddenly realized that he needed all the friends he could get, and his position became even more precarious when the High Court in Asaba made it clear that he will not get a tenure extention. So, with the party primaries just a few days away and Chief Clark breathing down his neck without mercy, Uduaghan moved to recover lost ground and went straight to the party and Chairman Nwaoboshi. He also needed Okowa to protect the Ika flank of Delta North so he kept his former SSG close and by so doing, gave Okowa the authority and audacity to drive his own campaign all the way. The party primaries was arguably the last plot that finally pitched Okowa against his PDP leadership in the state. The rumour that both the party and Governor Uduaghan had already endorsed Mrs. Ali as the Delta North Senatorial candidate and indeed some particular aspirants in the other positions, was stronger than ever and banking on the slogan ‘Party is Supreme’, Chairman Nwaoboshi moved to formally seal the deal. However, many delegates, especially those in Delta North, had insisted that all the candidates in all the positions should go for primaries to ensure a free and fair, one man, one vote election and this desire had divided the party right down the middle. The party leadership had then brought out guidelines which, according to reports, indicated that all the primaries would hold. According to sources inside the Delta PDP, the decision of the party was that the Governorship primaries and the Delta North Senatorial primaries would hold simultaneously. Prior to this however, the already embattled Governor Uduaghan had enough troubles on his plate and opted to stay out of the Delta North Senatorial controversy in the belief that Chairman Nwaoboshi had perfected whatever plan was afoot for the primaries, including the allegation that Result sheets had already been given to the preferred candidates and some huge financial leverage had been provided from the top to ensure that Delegates were properly reached and accommodated. And so on primary election day, while Dr. Emmanuel Uduaghan was consolidating his position at the Cenotaph, Asaba, word had it that the Senatorial primaries was going on simultaneously in Ogwashi-uku, the Senatorial Headquarters of Delta North, but this could not be confirmed. At the end of the primaries, Dr. Uduaghan won in Asaba, while word went round that Mrs Ali had won in Ogwashi-uku, but again this could not be corroborated. Not deterred by this news, the other candidates for the Delta North Senatorial seat promptly commenced their own primaries immediately after the governorship primaries. They even got a major national television network to beam it live to the world. In the end Dr. Okowa won with 942 votes, Dr. Cairo Ojougbo had 286 votes, Ned Nwoko had 78 votes, Dr. Mrs Mariam Nneamaka Ali (Kpakando) had 18 votes and Nduka Nwoye got 2 votes. But Chairman Nwaoboshi was not impressed with this show which he dismissed as a ‘charade’. In fact, prior to the Primary, Mrs Ali had allegedly fallen out with some of the members of her supposed political family, during the screening of aspirants. She was reported to have disrupted the screening of Delta North Senatorial candidates in Asaba, when she arrived the party secretariat for screening and learnt that Cairo Ojougboh was being screened by the five-man panel headed by Emma Atse. An eyewitness recounted that Mrs Ali allegedly demanded from Ojougboh why he submitted himself for screening after they had agreed that he would step down for her, but Ojougboh maintained categorically that he had no intention to step down for anyone. Confusion reigned in the room as supporters of both aspirants threatened to get into the fray and this was said to have prompted the other aspirants, led by Hon. Pascal Adigwe, to quickly issue a press statement warning that they will resist the imposition of Mrs Ali on them by the state PDP, as the candidate of Delta North Senatorial zone. To further spice up the matter, the electoral panel set up by the National Executive Committee of the PDP to conduct the party primaries election had surprisingly released its provisional result at Hotel Benezia, Asaba at a hurriedly arranged press conference, amidst palpable tension and speedily beat a fast retreat all the way to Abuja. The results were announced by secretary to the committee, Dr Lawrence Ezenwa immediately after which he and his team practically rushed to the door, without entertaining any questions from newsmen, and zoomed out of town, apparently in fear that some very dangerous people were after them. According to Dr. Ezenwa, the PDP Delta state party hierarchy wanted the five-man electoral panel sent from Abuja to conduct the primaries in the state to do its bidding but the panel refused and went ahead to conduct the primary which produced Dr. Ifeanyi Okowa as a clear winner of the Delta North senatorial ticket, amongst others. ‘We were stampeded out of the Government Lodge by the activities of the State party Exco to the extent that we were invaded and we had to be forced out; sincerely it is because of the result of this panel. Every single effort was made to frustrate us, but out of our own personal conviction we stood our ground to make sure that we get this thing done properly no matter whose ox is gored’. However, in a very swift reaction, the state chairman of PDP, Barrister Peter Nwaoboshi quickly classified the results as announced by the Dr. Lawrence Ezenwa committee as unconstitutional on the grounds that the Party had not yet verified the results of the primaries. Nwaoboshi described the primaries as flawed and claimed that it did not emanate from the Delta State PDP and that those results, not declared by the party is of no effect. A statement personally signed by Nwoboshi stated that, ‘I wish to draw the attention of the National Chairman of the PDP, the National Executive Committee, the National Working Committee, the entire PDP family in Delta State and the general public at large to the largely flawed primaries without the use of the authentic delegates list in most of the constituencies in Delta State. ‘Most importantly, the purported Delta North senatorial primaries held at the Delta State Cenotaph, Asaba in the night hours of 11th January, 2011 is illegal, null and void’. However, after some concerted protests, the PDP was compelled to re-shedule a re-run of the primaries and at the end of that exercise, which witnessed the withdrawal of Pascal Adigwe and Cairo Ojougboh and the decamping of Ned Nwoko who had already been endorsed as the Candidate of the Democratic Peoples Party (DPP), featured only Dr. Okowa and Mrs Ali. Okowa was declared the winner by the returning officer, Benedict Tawu, who announced that Okowa polled a total of 1,446 votes to beat Dr. Marian Ali, who scored 108 votes. But during the primaries, thugs believed to be separate loyalists of the Peoples Democratic Party (PDP) chairman in Delta State, Mr. Peter Nwaoboshi, invaded the Cenotaph venue of the re-run primaries and engaged in bloody clash with supposed loyalists of Okowa. In fact the primaries had gone half-way with Okowa coasting home to victory before Nwaoboshi and Mrs.Ali stormed the scene with some persons suspected to be thugs and questioned the methods adopted by the panel for the conduct of the intra-party election. In the melee that ensued many party faithful, including delegates, other leaders of the party, especially the members of the panel from the PDP national secretariat in Abuja led by Mr. Benedict Taiwo, as well as journalists who had come to cover the event, scampered into safety and suffered varying degrees of injuries as they rushed headlong into the near by bushes to take cover and run for dear life, as the mayhem unfolded and sporadic gunshots rend the air. Sanity was only restored by riot policemen deployed in the area by the Commissioner of Police, State Command, Mr. Yakubu Alkhali. Nwaoboshi returned a few hours later with Mrs. Ali and displayed a copy of what he said was the authentic candidates list, but party officials patiently listened to him, politely thanked him for the clarification and subsequently continued with the primary after he had gone. The outcome of the election amidst tight security confirmed that Okowa polled 1,446 votes to defeat Alli, who scored 108 votes. 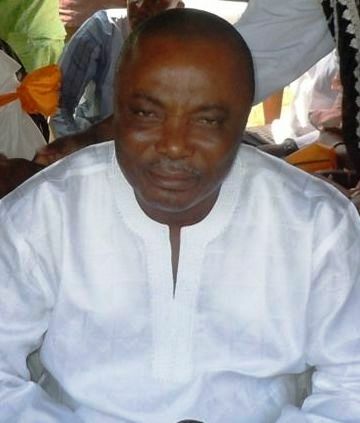 But again, the state chairman of PDP Peter Nwaoboshi, who had tried unsuccessfully to stop the primaries, dismissed the list used to produce Okowa as ‘fake’ and stated categorically that he cannot authentic the result because the electoral panel denied him access to the delegates’ list used for the primaries. According to Nwaoboshi, “I didn’t see the list they used in conducting the election. I demanded for it to compare with what we had here during the congress we held in 2008, but they (electoral panel) refused to bring out the list. In fact the intention of the electoral had been to come and cause confusion and destabilise the Party in Delta state”, he said. Delta watchers will recall that the Delta North Senatorial race, had principally been between two major candidates; Dr. Ifeanyi Okowa, (PDP) and Hon. (Prince) Ned Nwoko,(DPP). At the end of the elections, the Independent National Electoral Commission (INEC) Returning Officer for Delta North Senatorial District, Professor Mrs. Ebele Egwuiyanga released the official results of parliamentary election in the zone and Dr. Ifeanyi Arthur Okowa, the Peoples Democratic Party (PDP), scored 98, 140 votes to beat the Democratic Peoples Party (DPP) candidate, Hon. Ned Nwoko who scored 67, 985 votes. But in the course of the elections some PDP insiders had claimed that Dr. Okowa had lost the support of the leadership of the party and was on his own, following the embarassing events at the Cenotaph during the primaries. It was also alleged that Okowa had engaged in anti-party activities by purportedly sposoring Uche Ugbomah, a prominent PDP stalwart, who has been regarded for long as his right hand man, to contest the House of Reps election on the platform of the Accord Party, against the PDP candidate and incumbent Reps member, Hon. Ndudi Elumelu, who himself had belonged to the same political camp with Mrs. Ali, Cairo Ojougboh and Chairman Peter Nwaoboshi in the Obielum days. The emergence of Nwaoboshi had strengthened the bond and they had all thrown their weight behind Governor Uduaghan and the harmonised PDP and it was only politically logical to expect that all party members would fall behind any candidate endorsed by the party. But a major clash of interests emerged when Mrs. Ali and Dr. Okowa entered the Delta North Senate race and Elumelu, who himself was a contestant and needed the support of his party was naturally on the side of the Chairman, who in turn was bent on ensuring that Mrs. Ali emerged as the Senator for Delta North, in 2011. Thus, by allegedly sponsoring and supporting a candidate from another party, Okowa was deemed to have been guilty of anti-party activities. Again in the Ika Federal Constituency, Okowa was alleged to have moved against the party by sponsoring Victor Nwokolo, regarded in many quarters as one of his top loyalists, against the incumbent Reps member. Hon Doris Uboh. In fact, just like the case of Mariam Alli, Hon. Uboh had been regarded as the unquestionable choice of the PDP and there was even the added spice that she had been endorsed by the Presidency in line with the gender initiative of the First Lady, Dame Patience Jonathan. However, the people of Ika seemingly had a different opinion on the matter and after the first highly controversial PDP primary, which was reportedly won by Festus Chukwunyem (Chukky Dandy) but which was given to Doris Uboh, Okowa allegedly instructed his man, Victor Nwokolo to cross over to the Accord Party, just like the scenario with Uche Ugbomah in Aniocha/Oshimili, while Chukky Dandy crossed over to the Democratic Peoples Party (DPP). At the end of the elections, Victor Nwokolo was declared winner of the Ika Federal Constituency, but the controversy that rocked the elections was the primary reason for the initial injunction that stopped the presentation of INEC Certificate to Okowa and has been the bane of the petition filed against Okowa at the election tribunal. In addition, Okowa was also purportedly accused of allegedly compiling his own delegates list, with which he conducted the Primaries of both the Delta North Senatorial and the Ika Federal Constituency elections. The Delta PDP, according to reliable insiders, did not take these matters of alleged ‘anti party’ activities by Okowa kindly. Indeed word had it that the PDP leadership in the state had purportedly instructed its members to vote against Okowa in certain areas and a particular PDP chieftain and former Commissioner in the Uduaghan cabinet, said to be loyal to Okowa, amongst others, was suspended in the aftermath of the elections for disobeying that instruction. The fact that Dr. Okowa in particular and Victor Nwokolo won their elections had, according to impeccably sources within the PDP, become a further humiliation and monumental embarrassment to the party leadership and the need to affirm the slogan ‘Party is supreme’ had become an imperative that must be achieved, even if it means losing the Delta North Senatorial seat, like it did in 2007, when Senator Patrick Osakwe decamped to the Accord party and won, only for him to return to the PDP fold a couple of years later. This argument was re-inforced by the reminder from the sources, that the main contender to Okowa in the 2011 poll had actually contested the initial PDP primaries before decamping to DPP. However, the circumstances that threw up both Uche Ugbomah and Victor Nwokolo, needs to be put in some kind of perspective, which Okowa may not have been directly involved with. Delta Watchers will recall that Hon Ndudi Elumelu was embroiled (still is) in a litigation process with the EFCC, over his actions actions in the Power Probe Committee in collaboration with some other lawmakers in the 6th Session of the National Assembly, which had threatened to disqualify him from contesting the April 2011 elections. But the Delta PDP was bent on fielding him and chances were that if he got axed by the EFCC, the PDP would have no candidate for the Aniocha/Oshimili Federal Constituency election. So enter Uche Ugbomah, a staunch PDP stalwart but coming out under the ever ready Accord Party. However, some smart politicking by Elumelu had ensured that he was not disqualified after all, but by then the Ugbomah Candidacy had already been established and a lot of bad water had flowed under the Delta North Senatorial contest bridge which meant that any support for Ugbomah, who was regarded as Okowa’s right hand man, was always going to be interpreted as ‘anti party’ activity by the party leadership. The Victor Nwokolo case was a bit different for the simple reason that Ika people had reportedly kicked against the purported imposition of Hon. Doris Uboh on them by both the Delta PDP and the Presidency. The party primaries which she won was mired in controversy which led both Victor Nwokolo and Festus Chukwunyem (‘Chukky Dandy’) to decamp to the Accord and DPP parties respectively. Nwokolo was said to regarded as the more level headed candidate and this may have contributed to his victory, but the mere fact that he was seen as an Okowa loyalist, who defeated a PDP sitting Reps member was sufficient to raise the ‘anti party’ allegation. The dramatic twist to the Delta North Polls, provided by the returning officer for Ika Federal Constituency, Dr. Godwin Aviero, has remained the main contentious point in the election. Dr Aviero had earlier announced the results and declared the Accord Party candidate, Mr. Victor Nwaokolo, winner with 17, 235 votes to defeat incumbent member of the House of Representatives, Hon. Doris Uboh of the PDP who scored 15,129 votes while the DPP candidate Mr Festus Chukwunyem (Chukky Dandy) scored 9,433. But he suddenly did a volte face and claimed that he was kidnaped and later released. In a broadcast which was beamed nationwide and reported extensively, Dr. Aviero also alleged that the election was flawed with widespread electoral malpractices and added that indigenes of Ika North East were used to replace youth corps members ad-hoc INEC staff assigned to duty in the area. 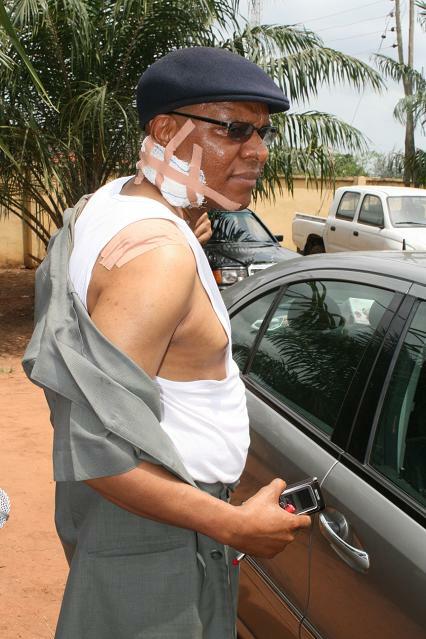 To further cast doubts and a frightening dimension on the Delta North Polls, Nigeria’s former High Commissioner to Sierra-Leone, Ambassador Godson Echiejile narrowly escaped death and was lucky to have his head still attached to his neck, when he was attacked and badly matcheted by suspected thugs allegedly loyal to a particular political party candidate in the Delta North senatorial race as he tried to stop some election malpractice in the Ika Federal Constituency. He was said to have been saved only by the Grace of God, when men of the Delta State Police Command on duty in the area miraculously intervened took him to the hospital. The INEC Headquarters in Asaba, the Delta State capital was subsequently besieged for several days following the April 9, National Assembly elections and prominent among the leaders of the protesters were Prince Ned Nwoko, Democratic Peoples Party (DPP) Delta North Senatorial candidate, Chief Great Ogboru, DPP Delta State Governorship candidate, Hon. Doris Uboh, Peoples Democratic Party (PDP) House of Representative candidate and even Ambassador Godson Echiejile who came all bandaged up to lend weight to the protests. Justifying the reason for the protests Hon Ned Nwoko accused the PDP and Dr. Okowa of manipulation and alleged that Okowa also forged the result in Ika south and Ika north districts. However, Ned Nwoko, still not satisfied with the manner the matter was handled in Asaba, proceeded to Abuja and allegedly armed with the statements of the Ika Federal Constituency returning officer, Dr. Aviero and other ‘very implicating’ evidence, succeded in getting an injunction from an Abuja Federal High Court to stop the presentation of certificate to Dr. Okowa by INEC. The rest as they say is now history. But that injunction was short lived as it was summarily vacated under seventy two hours and Dr. Ifeanyi Arthur Okowa is now the confirmed Senator for Delta North Senatorial District. But the history is still unfolding as the matter is now before the Delta State elections petitions tribunal and Delta Northerners are waiting with bated breath to see how the matter is resolved. Indeed the people of Anioma may yet tarry awhile because the matter may yet go all the way to the Court of Appeal if either of both parties feel sufficiently dissatisfied with any preliminary ruling on the matter. But one thing that has been eatablished is that the victory of Dr. Ifeanyi Arthur Okowa, especially during the PDP primaries in the state, is a clear testimony of his huge popularity with the membership of the party and indeed the people of Delta North, who see him both as a vibrant and dynamic symbol of the radical new reforms in the PDP and a solid advocate for the ‘One Man, One Vote’ revolution, championed by President Goodluck Jonathan and which was so central to the widely acclaimed success of April 2011 election. Dr. Ifeanyi Okowa has taken his rightful place as the Senator representing Delta North in the 7th session of the Senate and with that singular action, the initial fears that the Anioma interest may not be represented in the Senate has been finally laid to rest once and for all.